The MudHawk 6 comes with a unique Wireless Engine Shut Off key fob, giving the supervising adult an extra level of control. A simple push of the shut off button will turn the engine off and the MudHawk 6 coasts to a stop. When the child has corrected him- or herself, the adult can push the remote start to restart the engine for them. If your young rider is just learning about throttle control, the MudHawk 6’s throttle limiter will let you control top speed to fit his or her ability. When they demonstrate appropriate skill level, you can increase speed at your discretion. The MudHawk 6 is specifically engineered at the right size for your young riders. The chassis layout is designed to fit the average 6-10-year-old child. The MudHawk 6 uses a disc brake system on the rear axle to provide consistent stopping power. The hydraulic brake has a lightweight pull effort and an appropriately sized lever that your young rider can operate easily and confidently. The MudHawk 6’s front drum brakes deliver smooth stopping power. The brake drums fit compactly within the front wheels, enhancing the handling as well as slowing the vehicle down. The MudHawk 6 has 7-inch wheels that deliver excellent traction and performance across a wide variety of terrain, while also enhancing ride quality. 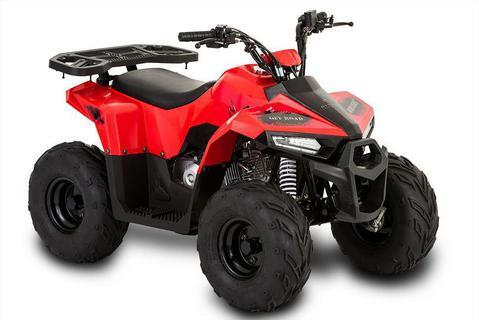 The air-cooled, SOHC four stroke engine is built tough to deliver fun for years. The smooth-running power plant features convenient electric start and has a unique Wireless Engine Shut Off key fob for parents’ peace of mind. Style and safety go hand in hand on the MudHawk 6. Cool LED front running lights help keep the MudHawk 6 visible when your young rider is adventuring around your property. The rear brake lights are also high visibility LEDs. The MudHawk 6 has an easy-to-shift transmission for forward, neutral and reverse. It uses a no-hassle CVT-style, fully automatic drive for simplicity. The shift lever is conveniently located on the left side of the unit. An illuminated gear indicator on the handlebars shows what gear it’s in. The MudHawk 6 has a fully functioning composite rear rack, complete with studs to anchor tie-down straps. Your young rider can pack along adventure essentials for a day of fun exploring your property.